Is there any evidence that mythical beasts really exist? Do you believe animals and magic are the perfect mix? Or are you the type of person who’s crazy for dinosaurs? What about believing all three scenarios are possible and making a profit from your beliefs while you’re at it! Deposit as low as $25 from now and until May 15th and you wont believe your eyes when a magical panda bear helps you create wins with a 100% Bonus + 50 Free Panda Magic Spins. Continue on the fantasy road when you win alongside everyone’s favorite monster with a 150% Match + 100 Free Loch Ness Loot Spins and end up in the Jurassic Era with 200 T-Rex Spins! 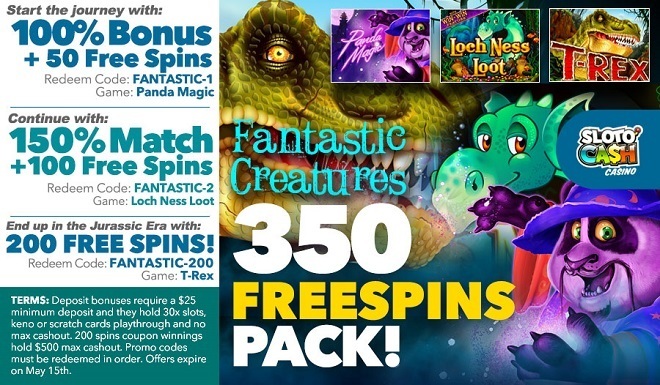 A magic panda bear, Nessie and a fierce dinosaur will join forces and help you amass wins when you deposit as little as $25 to play with 350 Free Spins! 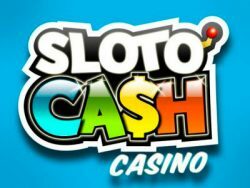 Deposit bonuses require a $25 minimum deposit and they hold 30x slots, keno or scratch cards playthrough and no max cashout. 200 spins coupon winnings hold $500 max cashout. Promo codes must be redeemed in order. Offers expire on May 15th.